Vegan Eats and Treats! : MoFo 23: Fresh from the Garden! MoFo 23: Fresh from the Garden! I'm really not an expert gardener - by any definition! - but if a plant is willing to make me something tasty to eat, I'm usually willing to take care of it. I buy almost all my produce at the farmers market... but there are a few things I manage to grow at home. This time of year, things are mostly winding down in our garden. Yesterday I finally did a last big tomato pick. The yellow bowl is filled with ripe and almost-ripe tomatoes that can hang on for a little while. 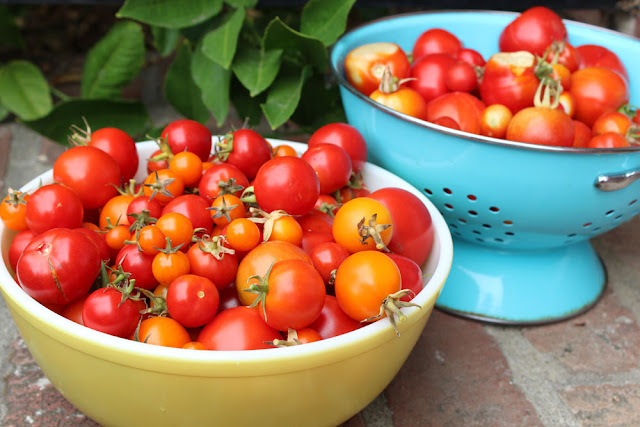 The blue colander has tomatoes that need to get used up ASAP. We had a crazy heat wave a little while back and you can see that some of the tomatoes got totally burnt on the sides where they were facing the sun. Crazy! There are still a few lonely straggler tomatoes left on the plants... I'll see if they ripen at all, or maybe I'll just pick them and have some green tomatoes. I also finally harvested my garlic recently. I still need to give them all haircuts (cut off the roots). 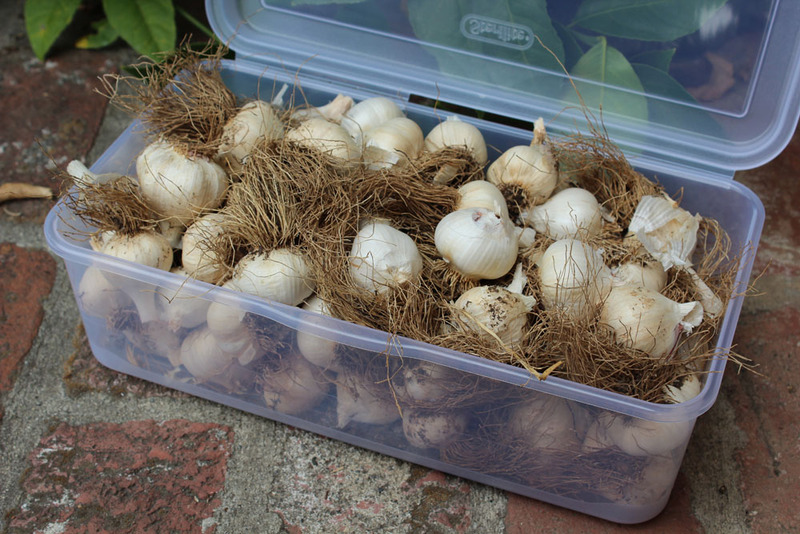 Then I'll pick out the largest cloves from the largest heads of garlic - and plant those for next year. This year I finally bought a nice little tupperware to hold all my garlics. I usually grow butternut squash too - it's sort of a family tradition. My grandparents used to grow millions of butternuts. They stored them and ate them all year long. I planted 3 plants, and only got 8 squashes, which is a pretty lame turnout, but still. It's the sentiment of the thing. Plus, it's most likely my fault for not watering them enough. I'm not very good about watering. One crop that is still definitely going strong is our apple tree. 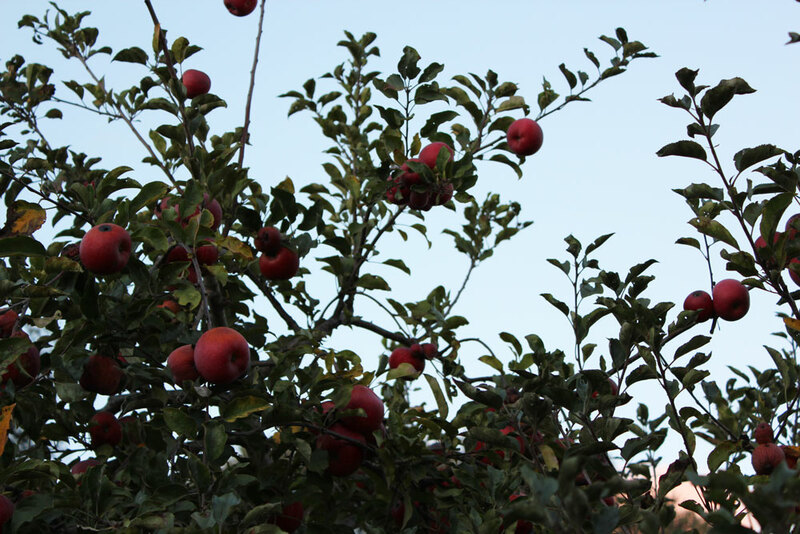 Our apples are a pretty late-ripening apple, so they usually stick around until almost Thanksgiving time. This year has been VERY ABUNDANT. Obviously, that's awesome - but it's also sort of oppressive. Pretty much all day long I am thinking "I should be picking apples. I should be making applesauce," and so on. Last night I was out picking at twilight, which was very beautiful. sometimes it feels like my tree is attacking me with its generosity! By the time I finished picking, it was dark out, and I took this crummy picture just for you. This is my crop so far, but this is probably only about 50% of our apples. That's a lot of apples! SERIOUSLY. Plus, I've already made two batches of applesauce. For whatever reason, almost all our apples have bugs or blemishes, which is sort of a drag. That white tupperware is something I bought for storing the "perfect" apples in our garage. Also, today I am planning to borrow my friend's dehydrator and make some dried apple slices. help! 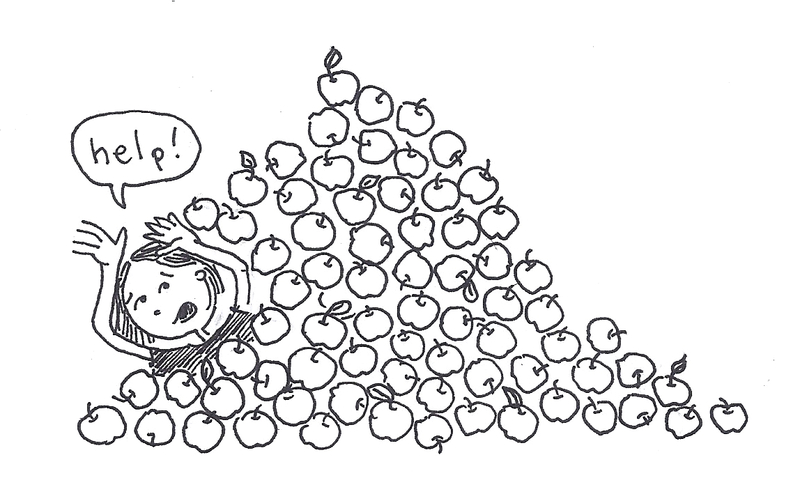 I'm drowning in a giant pyramid of apples! 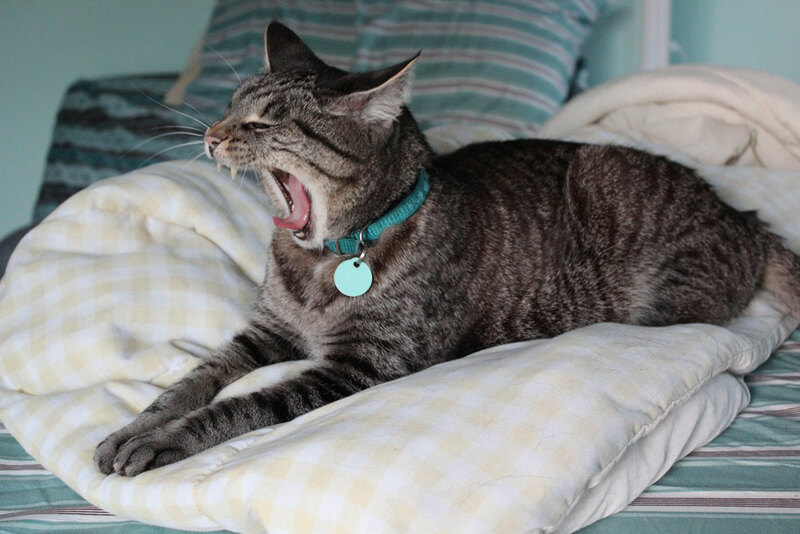 Here is bonus picture that I took of Yummers Potatoes yawning on the bed. Roar! don't forget to enter my giveaway for a copy of "Vegan Sandwiches Save the Day!" Yummers! And your garden harvest looks so wonderful. Especially the garlic. And that is a lot of apples!!! Everything looks beautiful! 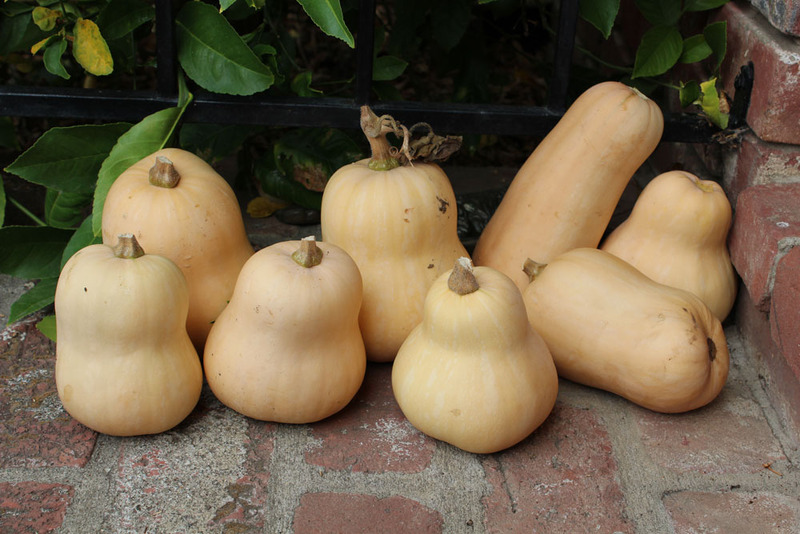 I love that growing butternut squash is a family tradition--it's such a nice thought. Is there a local food pantry that you could donate some apples to? I'm sure they'd be thrilled, and you'd know they were going to good use! Just a thought...I know I get overwhelmed with food sometimes too and I hate to waste it! We had a very pathetic year here! I got almost no tomatoes and I had about 12 plants in brand new composted soil. No peppers, zero winter squash (they kept rotting off) and 1 okra. My cukes were the only thing that seemed to go and go! 1. Yummers is killing me. That is the new best picture ever. 2. Oh man that's a lot of apples! It's insane that some of your tomatoes got burnt - I'm looking out my window and seeing snow, so the concept is hard to grasp, ha ha. :) Too bad the butternut haul wasn't that great, usually squashes just freak out and overproduce! In my limited experience, anyway. It should say something about my pitiful squash turnout that I am super jealous of your eight butternuts! thats a great turn out! all the garlic looks simply amazing! 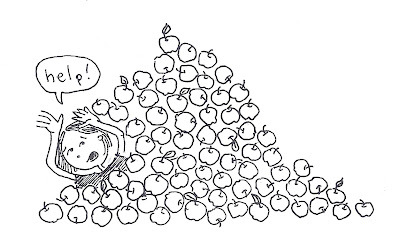 and that's sooooo many apples! i wish i could garden! Hahaha, you are oppressed by apples! Definitely a good problem to have. You may not consider yourself an expert gardener, but your beautiful and mostly bountiful produce speaks for itself! Wow. 8 butternuts. I know you say that's a lame turnout, and it might be, but EIGHT gorgeous homegrown butternuts. My favorite veg that is. On the apple subject, I know people who have trees that would produce at least 10 times what you picked, and my father in law has a lot of apple trees, and he takes a lot of them to a place where they'll make apple juice out of them and you get to but it to a cheap price! That's a great thing, maybe that exists where you live too? 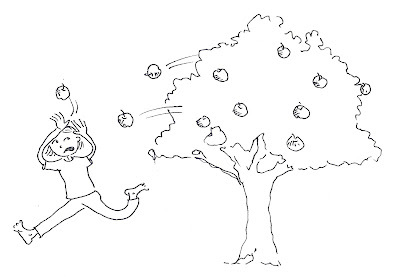 I love your sketch of the tree throwing apples at you. Actually, all of your sketches make me smile. It's funny how all of your butternut squash are short and fat except for one! Silly squash. Wowee! You got so much produce and it all looks amazing! And Yummers - love that big roar/yawn! 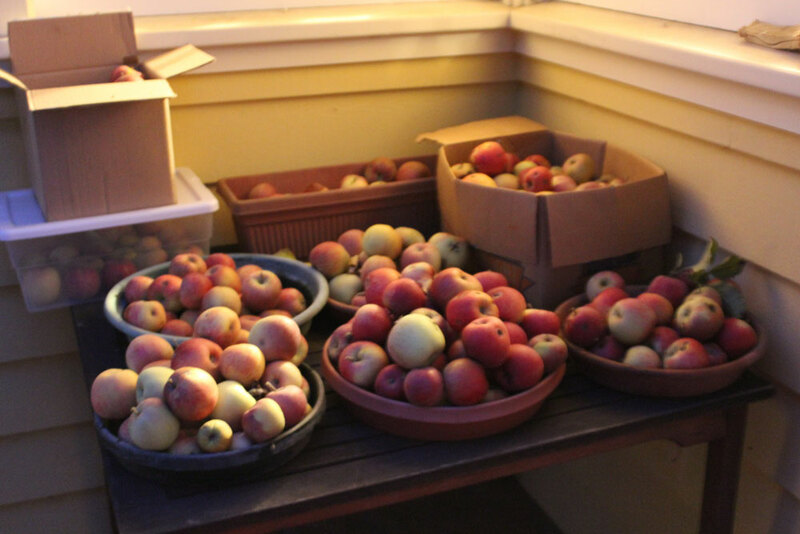 I'm so jealous of your apple haul! It looks amazing. We're just starting to get our garden started here, I was thinking of growing garlic but for some reason I thought it seemed too hard. But all your garlics have made me want to try it! Wow! All of that from your garden?! amazing! Cray Boy is the gardener. I kill cactus.